Boddhi Satva – From I <3 NY to TORONTO and Everything In Between….. If you’re still curious about this guy, I suggest you read this album review! He’s cleaned up his act. No more sound production in the red- we hear a Boddhi sound that draws on his African roots. Bringing artists that may be popular or well known to us (in North America) and spinning it with a tropical and even ‘luscious’ sound. On the other hand, he brings artists that are known to experiment with music, for example Bonobo’s Heaven for Sinners feat Erykah Badu that contains a mash-up Afro-Caribbean sound! I call it Afro-Caribbean as it at times sounds liked Calypso-House-Tech…. ‘Ancestral Interpretations‘ is a brilliant title because it encompasses the general sound. It gives listeners a chance to take it in whichever way they want and understand in whatever way they should. ‘Ancestral Interpretations’ is a great pulse checker to capture audiences and dancers that wouldn’t seek out Boddhi Satva’s music or sound; also to see what fans and followers already enjoy. It’s also a fabulous album of tracks for DJ mixes. These interpretations are a mix of all songs: traditional African griot style, pop, contemporary, neo-soul & Jazz. This shows us a little taste of what Boddhi listens to and much of what has influenced his musical tastes. He’s honed in on his niche and is sticking to it (I ain’t mad about that!) I was expecting his signature heavy Djembe or Congo drums but I heard a lot more rhythm. Famous Malian griot Sekouba Traore is used to open the CD with track Donson (a traditional hunting song). Donson is re-worked as ancestral soul house and this ‘interpretation’ envelopes your ears. One of many traditional songs only heard by local Malians and Boddhi brings it not only to North America, but to the dance floor…this IS as underground as it gets. My favourites hands down: Rihanna-Stay, Justin Timberlake’s-Spaceship Coupe, Sekouba Traore-Donson and Brit Dubstep artist James Blake’s Overgrown (HEAVY). Honorable mentions include: J-Dilla’s Fall in Love, Frank Ocean’s Pink Matter and Jose James Vicadin. 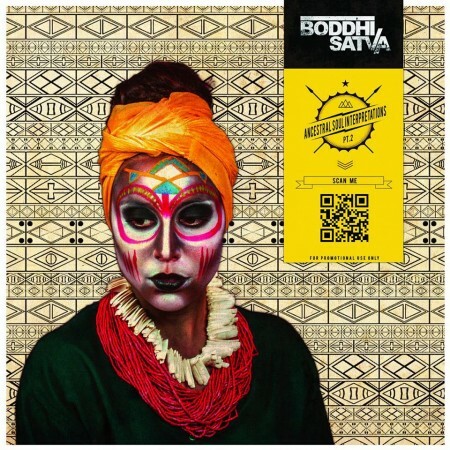 One way to appreciate what Boddhi brings to this album is to listen to the originals. You’ll be blown away! This album is designed for open-minded listeners and international audiences who can enjoy different formats of music. Ancestral Interpretations is a great summer album with HOT beats for hot club nights!